Another Diamond Waves hat. I just love this pattern; its so beautiful when its finished. I made this one for my sister with stash yarns I had laying around–1 skein of Blue Sky Alpacas Worsted Hand Dyes in gold and some scraps of Tanis Fiber Arts Green Label Aran in shadow. I love it. 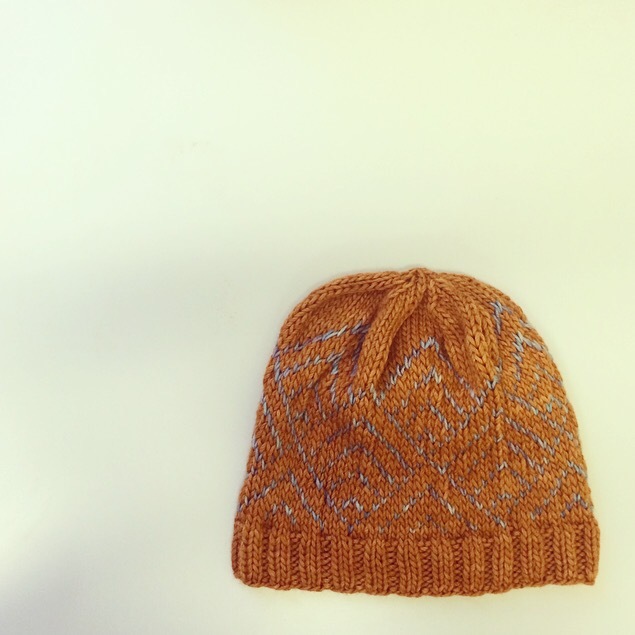 The shadow colorway is subtle in the fair isle and does just that– creates this shadow of sorts. I modified the crown so it wasn’t so tall since my yarn was a bit bulkier than I think the called for Malabrigo Merino worsted. But I used the slightly heavier yarn for the main color because my sister complains my fair isle hats don’t fit down over her ears and I wanted to make sure this one was loose and fit her well. There’s no point in wearing a hat in New England that doesn’t cover your ears. Here’s the other Diamond Waves hat I made. I recommend everyone make this hat. The rewards are endless. 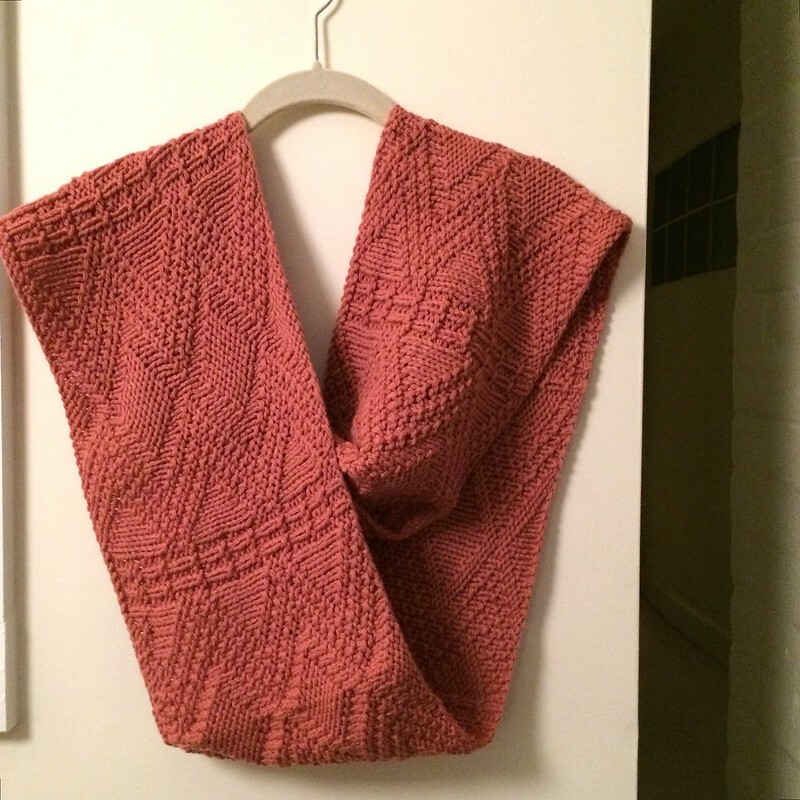 So happy with the finished product on my Avery Cowl, knit up with two skeins of the gorgeous and ridiculously soft Quince and Co. Osprey in the clay colorway. This color is just as I hoped it would be–I wanted it to look like the dusty red clay of the desert and it’s stunning. I knit Avery for my mum for Christmas; she loves cowls and I think she’s going to appreciate the diamond detailing on this one, as well as the color choice. It will go well with any jacket. I recommend buying a third skein of Osprey because I did not have enough yarn to finish the very last row of the pattern and bind off. You can’t tell I’m one row short (because one row, really), but if you want to follow this to a T, I’d get one more skein. I’m assuming the pattern doesn’t call for 3 because you’d either knit tight enough not to need a third, or use so little of the third, that yardage called for in this pattern is slightly fudgy. 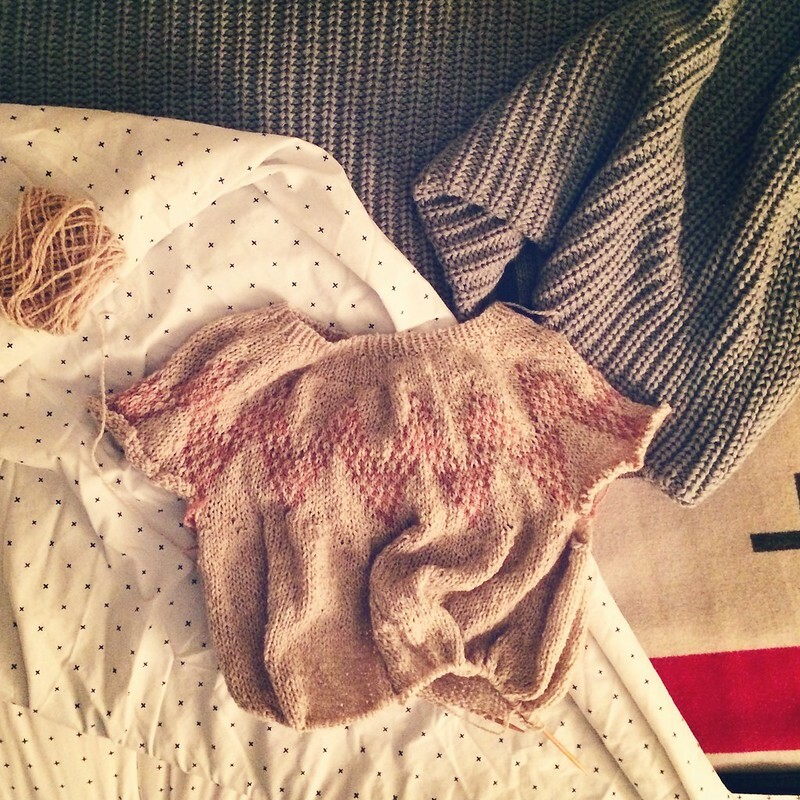 I feel like I’m a pretty technically proficient knitter–not too tight or loose. And I even used the yarn the pattern specifically called for. Just a tip for anyone who wants to knit Avery. Everything about this pattern was fun; easy to memorize the chart, enough detail to keep in interesting and rewarding, but easy enough to do with distractions around. Plus, it took a few nights on the couch after work. What hand knits are you gifting this holiday season? I’m definitely going to make one of these for myself in the New Year. I made this ridiculously quick hat out of leftover bits of Brooklyn Tweed Shelter I had after finishing my Chevrons sweater. Diamond Waves by Kaleigh McLelland is so quick and the finished product is amazing. Plus, its free on ravelry. I recommend everyone make this hat. I will be gifting it to my guy for Christmas. 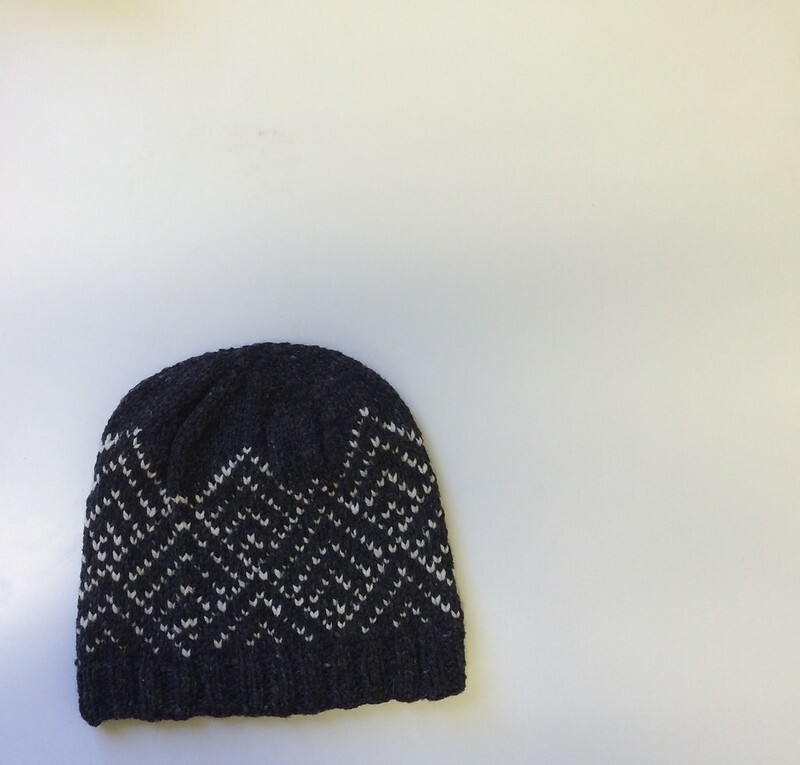 Knit up using BT Shelter in cast iron for the main color and fossil for the fair isle details. I’ve done it. 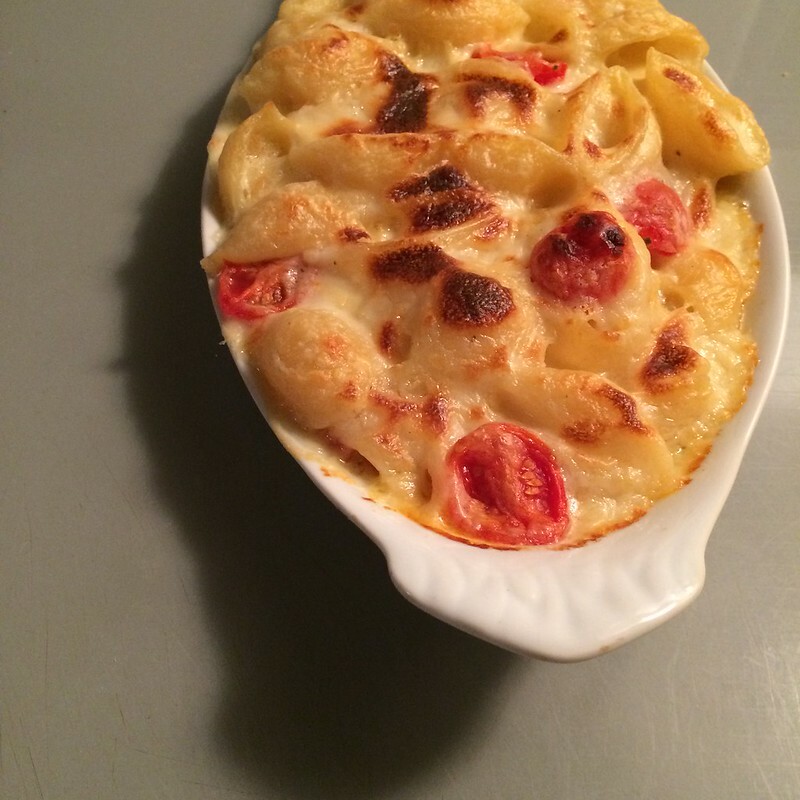 I’ve made what I consider to be one of the most delicious individual mac n cheese boats I’ve ever whipped up. Filled with a thick homemade mornay featuring a dash of dry mustard, gruyere, sharp cheddar, and parmesan cheese, this dinner was a dream. A dream. I decided to roast some grape tomatoes and throw them in for a little acid and some veg in all that deliciously fatty cheese overload. It was amazing. Baked in the oven at 370 until hot and bubbly, then finished under the broiler until there was some burnt crisp cheese on top. Make this. You won’t regret it. F*ck. 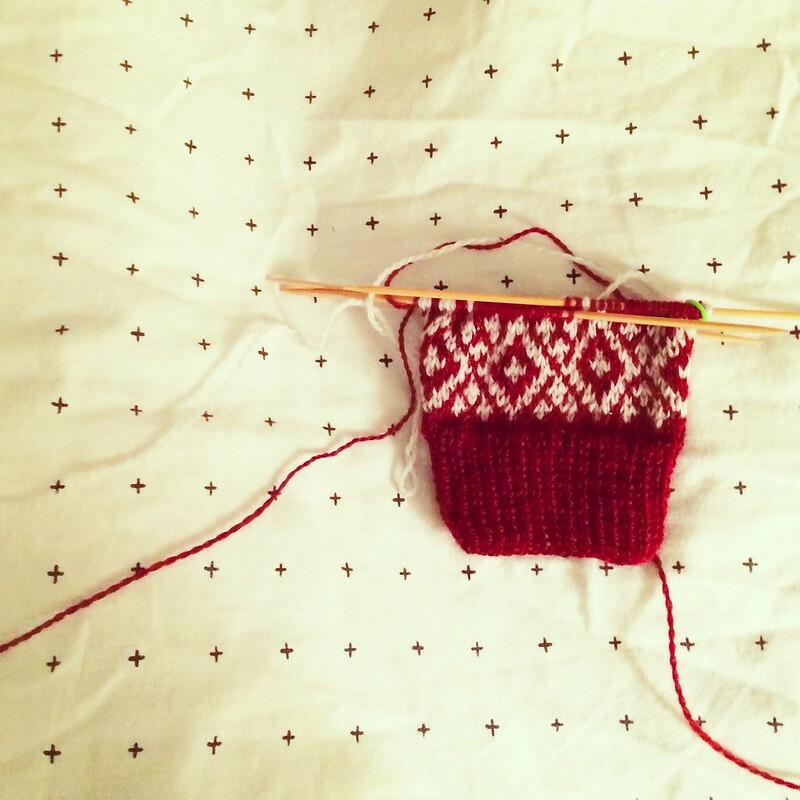 Progress on those cheeky fair isle mittens I’ve been working on for the past few days. I have tiny hands; these will for sure be far too long for my puny self. Will likely be a gift for someone else. But loving them, nonetheless. Knit up using two skeins of Knit Picks Palette in garnet heather for the main and mist for the contrast. The underside also features a gorgeous striping pattern. Will post proper snaps when they are finished. I drink a lot of coffee. Ridiculous amounts, in fact, which you know, if you’ve been a reader of this here blog for, say, a day. On Saturday, I visited my friend Mack, who lives in Providence, and we perused this amazing little local kitchen shop within walking distance of her house, Stock Culinary Goods. 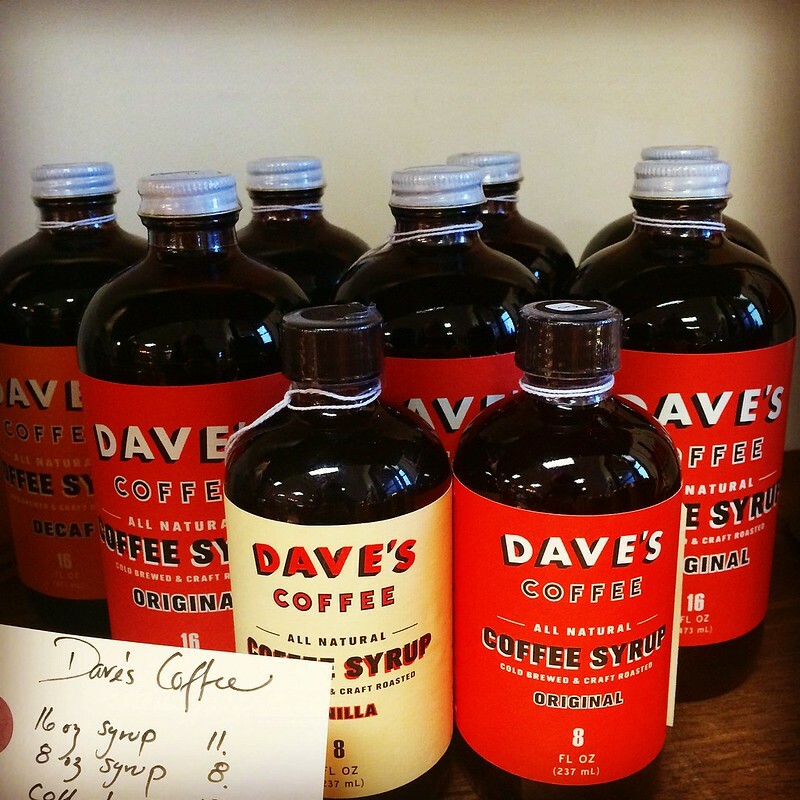 I picked up some local Dave’s coffee syrup to make a Rhode Island favorite–coffee milk. I’m going to get into it. 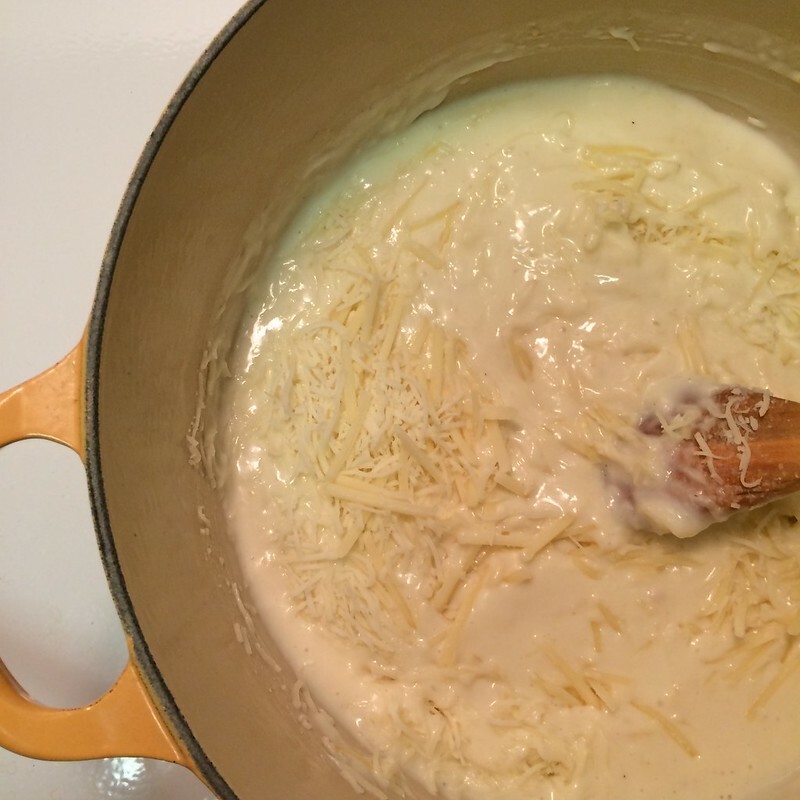 This is what I call ridiculously cheesy homemade béchamel–or, er, a mornay sauce. A mornay. Isn’t it a beauty? This is the stuff of dreams to eat when its winter and rainy and snowy and icy in Boston. Taking a break from the sweater knitting to cough up some fair isle mittens, which I will likely gift to someone for Christmas. These will be funny, and slightly inappropriate, mittens. They are How Cold Is It? 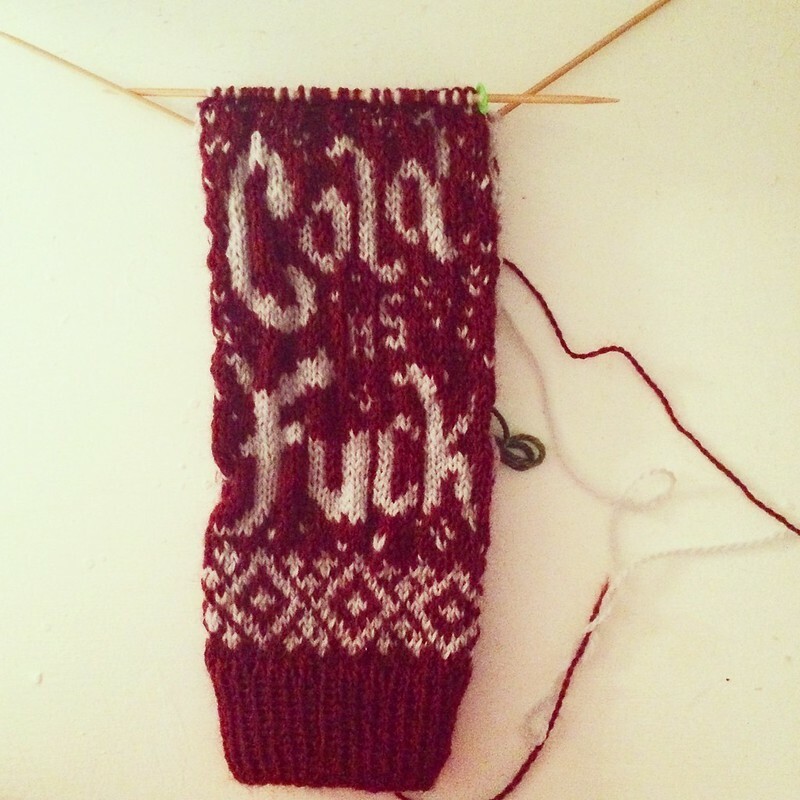 by Drunk Girl Knits. I’ve made significant progress since this photo of the cuff was snapped, and I did a bit of modification but I’m loving them and once the pattern is established, they are pretty quick to knit. These mittens are knit with Knit Picks Palette in garnet heather for the main color and mist for the contrast. Stash busting projects are the best. It’s that time of year. 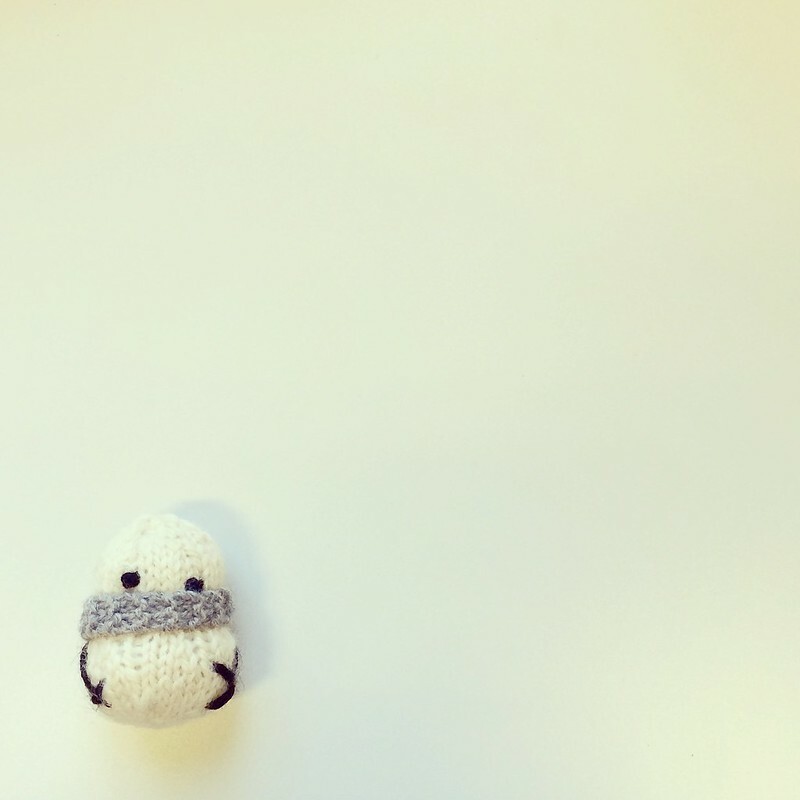 That time when I spend a lot of my knitting hours making little babies like this snowman. I turn them into ornaments and gift them out. People love them. You can find the pattern for these guys, plus some adorable santas, too, over at mochimochiland. Tis the season. I’m not big on decorations. 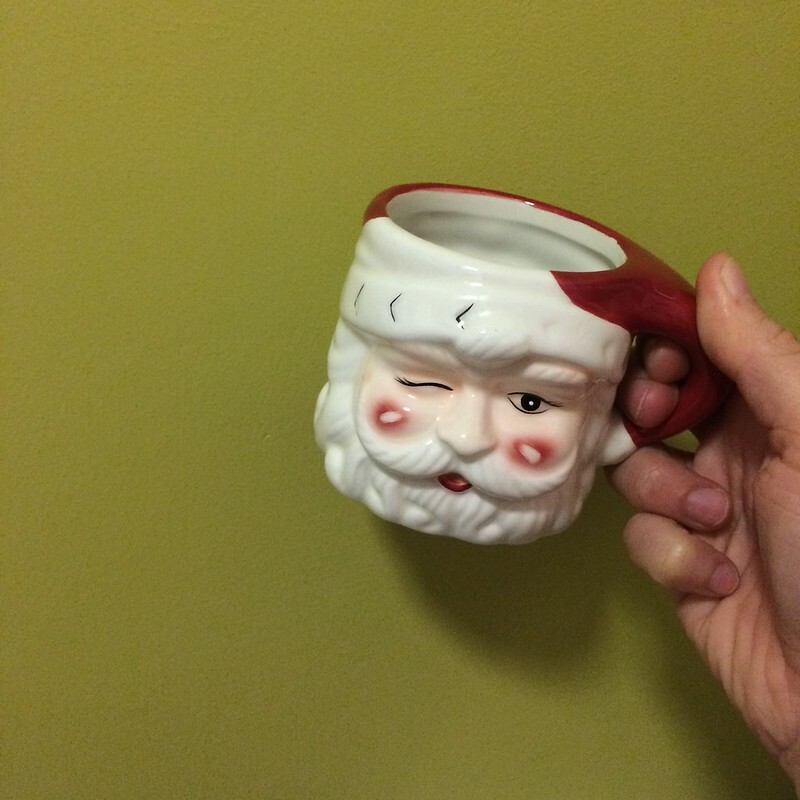 I have a vintage ceramic tree and these adorable Santa mugs, which I am happy to drink coffee out of from Dec. 1 through the New Year. I’m currently learning–along with 10 other adorable middle schoolers I work with–how to batik. A co-worker is teaching it as an art elective and I am her “assistant”. 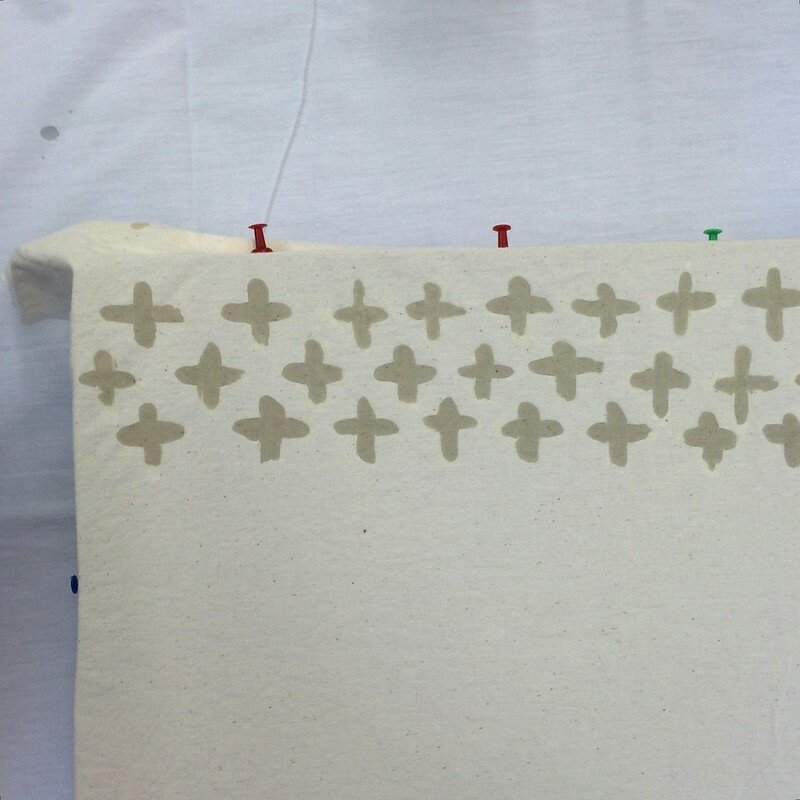 This is the first phase of the process–stretching muslin on cardboard frames and hand painting hot wax in designs on the fabric. It’s hard to make sure your brushstrokes of wax actually penetrate all the way through the fibers. Mine is pretty wonky but it’s my first. I’m excited about this new little crafting endeavor. I’m teaching the kids alone on Friday; here’s to hoping I don’t mess it all up.